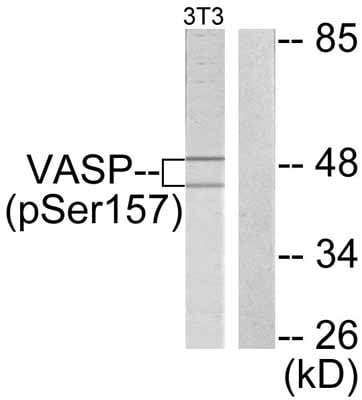 Detects endogenous levels of VASP only when phosphorylated at serine 157. Synthetic phosphopeptide derived from Human VASP around the phosphorylation site of serine 157 (R-V-SP-N-A). Human tonsil tissue. NIH/3T3 cells. 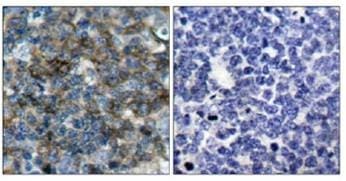 This antibody was affinity purified from rabbit antiserum by affinity chromatography using epitope specific phosphopeptide. The antibody against non-phosphopeptide was removed by chromatography using non-phosphopeptide corresponding to the phosphorlyation site. Our Abpromise guarantee covers the use of ab47268 in the following tested applications. WB 1/500 - 1/1000. Detects a band of approximately 46 kDa (predicted molecular weight: 42 kDa). Ena/VASP proteins are actin-associated proteins involved in a range of processes dependent on cytoskeleton remodeling and cell polarity such as axon guidance, lamellipodial and filopodial dynamics, platelet activation and cell migration. VASP promotes actin filament elongation. It protects the barbed end of growing actin filaments against capping and increases the rate of actin polymerization in the presence of capping protein. VASP stimulates actin filament elongation by promoting the transfer of profilin-bound actin monomers onto the barbed end of growing actin filaments. 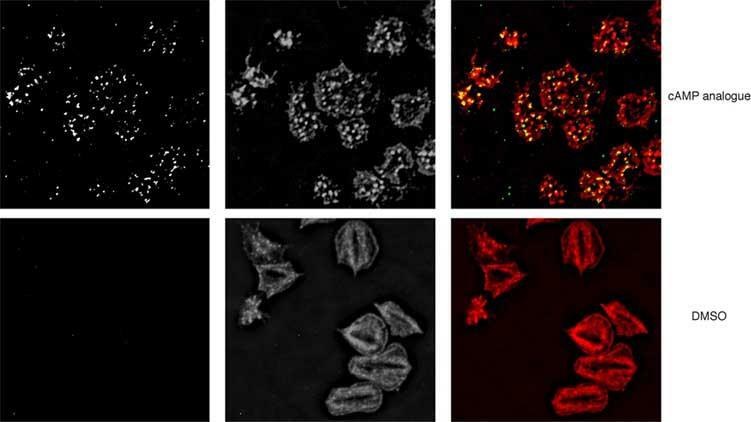 Plays a role in actin-based mobility of Listeria monocytogenes in host cells. Regulates actin dynamics in platelets and plays an important role in regulating platelet aggregation. Belongs to the Ena/VASP family. The EVH2 domain is comprised of 3 regions. Block A is a thymosin-like domain required for G-actin binding. The KLKR motif within this block is essential for the G-actin binding and for actin polymerization. Block B is required for F-actin binding and subcellular location, and Block C for tetramerization. The WH1 domain mediates interaction with XIRP1. Major substrate for cAMP-dependent (PKA) and cGMP-dependent protein kinase (PKG) in platelets. The preferred site for PKA is Ser-157, the preferred site for PKG, Ser-239. In ADP-activated platelets, phosphorylation by PKA or PKG on Ser-157 leads to fibrinogen receptor inhibition. Phosphorylation on Thr-278 requires prior phosphorylation on Ser-157 and Ser-239. In response to phorbol ester (PMA) stimulation, phosphorylated by PKC/PRKCA. In response to thrombin, phosphorylated by both PKC and ROCK1. Phosphorylation at Thr-278 by AMPK does not require prior phosphorylation at Ser-157 or Ser-239. Phosphorylation modulates F-actin binding, actin filament elongation and platelet activation. Carbon monoxide (CO) promotes phosphorylation at Ser-157, while nitric oxide (NO) promotes phosphorylation at Ser-157, but also at Ser-239. Response to NO and CO is blunted in platelets from diabetic patients, and VASP is not phosphorylated efficiently at Ser-157 and Ser-239. Cytoplasm. Cytoplasm > cytoskeleton. Cell junction > focal adhesion. Cell projection > lamellipodium membrane. Cell projection > filopodium membrane. Targeted to stress fibers and focal adhesions through interaction with a number of proteins including MRL family members. Localizes to the plasma membrane in protruding lamellipodia and filopodial tips. Stimulation by thrombin or PMA, also translocates VASP to focal adhesions. Localized along the sides of actin filaments throughout the peripheral cytoplasm under basal conditions. ab47268, at 1/50 dilution, staining VASP in Human tonsil tissue by Immunohistochemistry, Paraffin-embedded tissue. 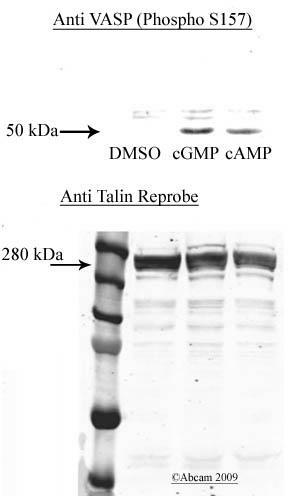 Left panel: no peptide; right panel: with immunizing phosphopeptide. ab47268 has not yet been referenced specifically in any publications. Publishing research using ab47268? Please let us know so that we can cite the reference in this datasheet.